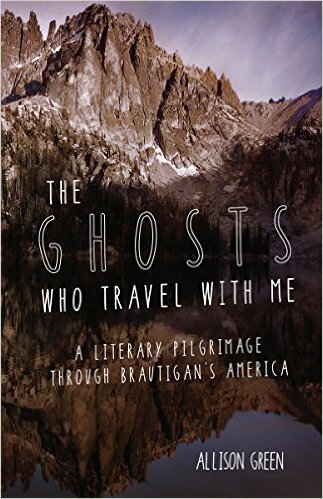 Recently, I had the pleasure, and the honor, of reading and reviewing author Allison Green’s memoir, The Ghosts Who Travel With Me: A Literary Pilgrimage Through Brautigan’s America, for the Los Angeles Review of Books. Green’s pilgrimage is a poignant and beautifully written story, told in short chapters, about the many ghosts in her life—family, ancestors, Idaho, her adolescent self, and especially, her relationship to Richard Brautigan (best known for his novel Trout Fishing in America), the hippie era author she adored as a teen and young adult. As a grown woman, however, returning to his work, she discovers something about Brautigan that causes her to reevaluate the origin of her admiration for him and the America about which he wrote. Grappling with her revelation, she sets out to trace Brautigan’s footsteps through Idaho (her ancestral home and setting of Trout), and the end result is this insightful, sensitive, humorous and poetic memoir. Which comes highly recommended from me to you. And go buy Green’s book HERE! This entry was tagged Allison Green, literature, memoir, The Ghosts Who Travel With Me, Writing. Bookmark the permalink.